The first race in the Round of 8 for the Monster Energy NASCAR Cup Series playoffs resumes Sunday with the First Data 500 at Martinsville Speedway. The green flag on Sunday flies at 2:30 p.m. EST on NBCSN. Here are a few people to keep an eye on for Sunday’s race, courtesy of Frontstretch.com's Corey Brewer. Busch is the early favorite to win this weekend and be the first driver to clinch his way into the Championship 4 at Homestead-Miami Speedway. He has two wins at Martinsville, both within the last three seasons, and has developed into the sport's top short track driver. In Busch's 2016 win, he led 352 of 500 laps. In this race a season ago, he led 184. Busch has finished either first or second in the last three Martinsville races and hasn’t finished outside the top five since 2014. Keselowski failed to make the cut last weekend and was eliminated from the NASCAR playoffs. But even though this year's championship is a lost cause he is still a top contender to win at Martinsville. He has five straight top 10s at the paperclip, including a win in 2017. He has also led over 100 laps in two of the last three races. The No. 2 could easily make it to No. 1 on Sunday. Harvick may not have landed in Victory Lane during the last 10 races but he is still running well to start the NASCAR playoffs. He has led laps in five of six races and started on the front row three times. That alone is reason to keep an eye on him this weekend. Aside from that, he has two straight fifth-place finishes at Martinsville. Hamlin has been touted as one of the best short track racers in NASCAR over his career. That statement is backed up by five wins at Martinsville. He has the second most victories, top 10s and laps led among all active drivers, also capturing three pole positions. Hamlin has four straight top-10 finishes in the fall event at this track and is looking to play spoiler this weekend following an early playoff elimination. Blaney dominated at Martinsville earlier this season during the middle portion of the race. He led 145 laps but was ultimately unable to secure the win, finishing a career-best third at the track. He has had the car to beat on short tracks multiple times this season but was eliminated from playoff contention last weekend. Expect the Team Penske driver to be a sleeper pick. Almirola finally got the monkey off his back a couple weeks ago at Talladega and won his way into the Round of 8. Now, he will have to continue to fight to make the final round. With how strong the Stewart-Haas Racing stable has been recently, any one of the four could take the checkered flag on Sunday. Almirola has momentum and also the underdog factor going in his favor. Allmendinger is the go-to bargain bin driver this weekend. He may be known as a road course ringer but the Californian has also had Martinsville’s number over the duration of his career. He has four top-10 finishes in the last five races at the track. Meanwhile, he has an average finish of 18.8 through 20 starts but has bested that over the past five races. 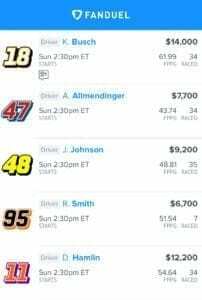 Another top 10 would be like a win for JTG Daugherty Racing's small team and even better for those who have Allmendinger in their lineups. He matched a career-best second-place finish in the spring race in 2016.